Today, in Canada, we celebrate Victoria Day which is a federal Canadian public holiday celebrated on the last Monday before May 25, in honour of Queen Victoria's birthday. For most folks, it is considered much like Memorial Day in the United States and a sort-of official start to summer. For myself, it is the day to attend the the annual hometown Flea Market. The little village in which I live turned out in huge numbers this year. The Mister does not care for Flea Marketing so he played a round of golf while I went treasure hunting. I specifically hoped to find some 1920's or '30's pottery mixing bowls. I hemmed and hawed over some lovely vintage bowls I saw last year and lost out on them. You snooze, you lose. 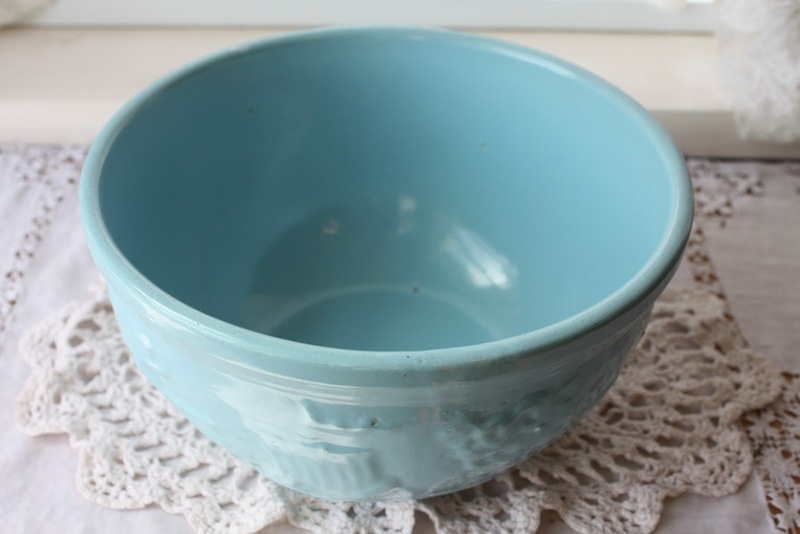 This year, I spied this lovely blue pottery bowl shortly after I began looking for treasures. I said to the seller that I really liked it but I wanted to look around for a bit...I'd be back. They said fine, but then I saw other folks looking at "MY" bowl. I marched up to the seller, handed her my cash and declared, "It's mine!" She laughed and said she thought I made a good bargain. I did indeed! My grandmother used to mix up her delectable goodies in bowls similar to this. This particular bowl is smaller than hers but will most definitely suit my purposes well. 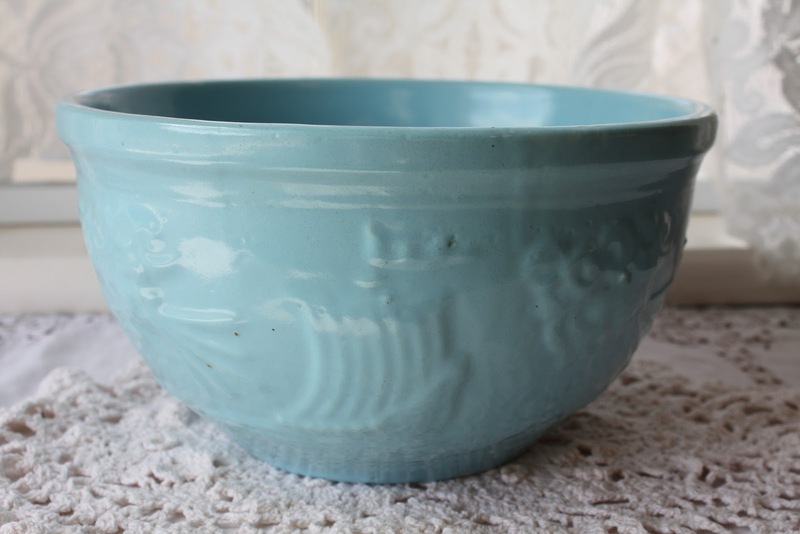 This blue pottery bowl has a wonderful seafaring story around the outside of it. It's almost mystical. OK...am I getting a little too imaginative about it's worth/value/story it has to tell? I don't think so. I love it and got it for a great bargain too. I was very happy to leave with it tucked safely in my bag. There was a lot of "junk" at the flea market, but you know... one man's junk is another's treasure. 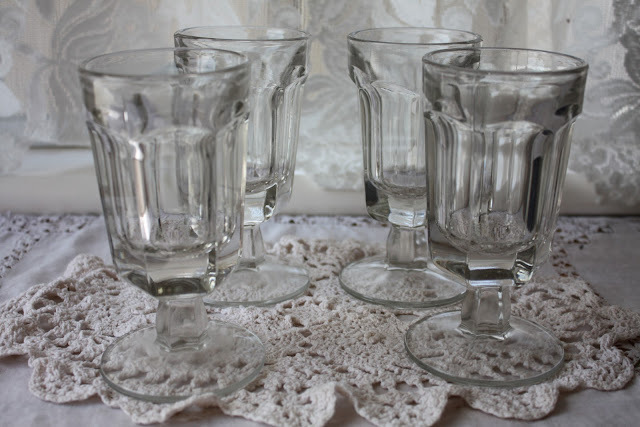 I saw these pressed glass parfait glasses and just had to have them. Last year I bought parfait spoons. This year I found the glasses to go with them. The Mister is going to enjoy eating our homemade ice cream out of them. That was the extent of my good finds this year. I didn't have very much cash in my pocket but I am quite pleased with what I did find. Yesterday was Gabriel's birthday and I haven't posted about my pups in a while. Gabe is now 6 years old. Interesting...I first began my blog 6 years ago right after we picked up Gabe from our breeder's place. 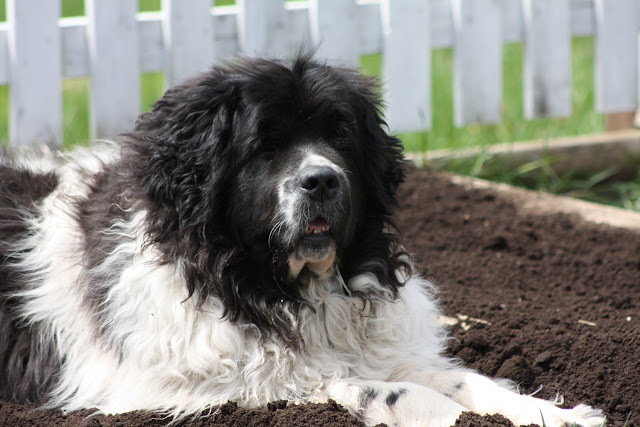 I have three Newfoundland dogs and Gabe is a Landseer Newfoundland. Yes, I know...he needs a trim. But I just love Gabe's floofy fur. I think (or perhaps HE THINKS) he looks like Fabio with his flowing locks. Happy Sixth Birthday, Gabe-y Baby! You da man! Tell Gabe he could give Fabio a run for his money with those beautiful flowing locks of his! I love that blue bowl. I came over from Knick of Time just to gaze in wonder at its beauty. I am glad to find you thought it was worth purchasing too! I love the beautiful blue bowl.